The Paul & Daisy Soros Foundation announced today the recipients of the 2017 Paul & Daisy Soros Fellowships for New Americans, a graduate school fellowship program for outstanding immigrants and children of immigrants in the United States. The recipients, chosen for their potential to make significant contributions to US society, culture, or their academic field, each receive a fellowship worth up to $90,000 and join a community of nearly 600 Fellows from past years. 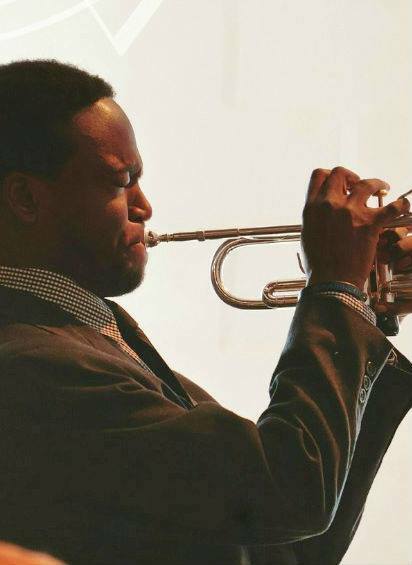 Among the 2017 recipients is New England Conservatory (NEC) jazz trumpet graduate David Adewumi. 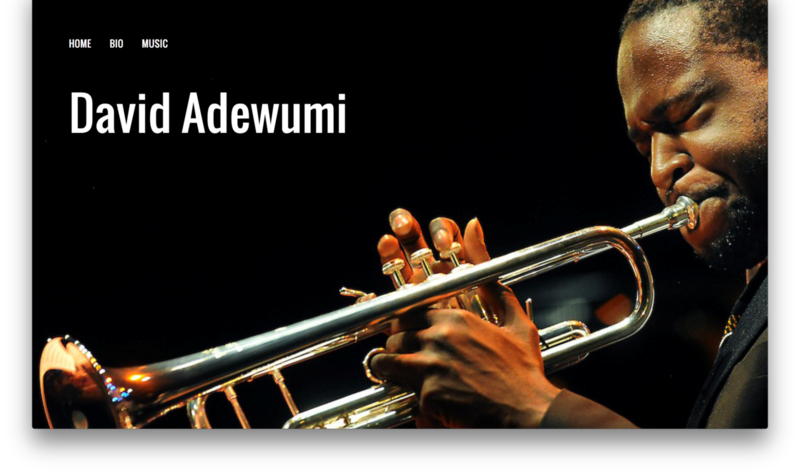 The child of Nigerian immigrants, Adewumi will use his fellowship to continue his jazz trumpet studies at the Juilliard School of Music. Adewumi joins the list of NEC students honored with the prestigious fellowship, which also includes cellist Christine Lamprea (2012 Fellowship to pursue MM studies at NEC), guitarist Grisha Goryachev (2006 Fellowship to pursue doctoral studies at NEC), and composer/NEC graduate Lei Liang (2002 Fellowship to pursue doctoral studies at Harvard). 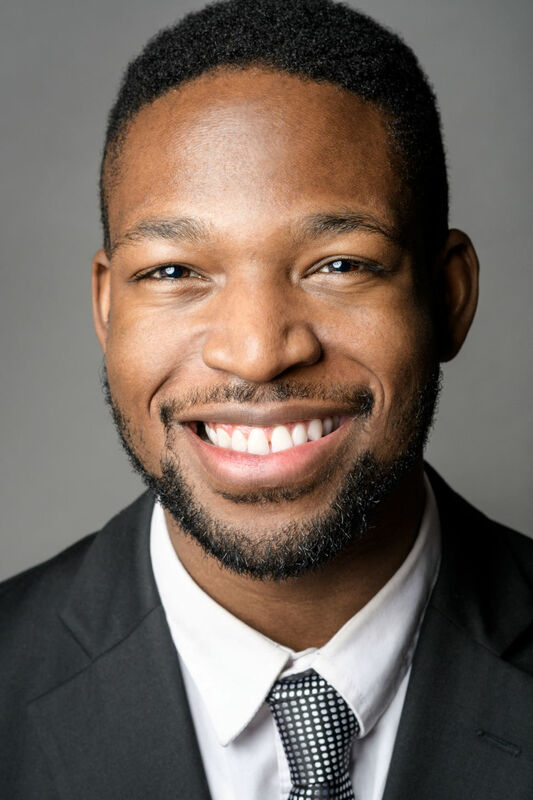 “New England Conservatory gave me the freedom to explore my creative potential and the resources to develop my artistic vision,” says Adewumi. “The teachers and mentors that I have had the opportunity to spend time with, care about the future of the music. Their wisdom has propelled me into the extraordinary opportunities that I have today. I am grateful for the years that I spent at NEC and will never forget the people that helped me on my path to becoming an advocate for the music "
This year’s applicant pool of 1,775 was the most competitive in the history of the fellowships. In addition to receiving up to $90,000 in funding for the graduate program of their choice, the Fellows join the prestigious community of recipients from past years, which includes individuals such as US Surgeon General Vivek Murthy, Chief Scientist of Artificial Intelligence at GoogleCloud Fei-Fei Li, pharmaceutical CEO Vivek Ramaswamy, Lieutenant Governor of Washington Cyrus Habib, leading ACLU attorney Nusrat Choudhury, award-winning writer Kao Kalia Yang, and nearly 600 other New American leaders. The 2017 Fellows, who are 30 or younger, come from a range of socioeconomic backgrounds, and are all naturalized citizens, green card holders, or the children of immigrants. Their backgrounds reflect the diversity of recent immigrants and refugees in the United States. David Adewumi's immigration story begins with his grandparents, both educational reformists from Nigeria, who immigrated to the United States in the late 1970s to complete doctoral programs at Columbia University. After graduating, they returned to Nigeria, where they raised David's mother and her siblings with a focus on education and hard work, as well as with a deep admiration for the United States. Following in their footsteps, David's mother and father eventually immigrated to the US and settled in New Hampshire, where David was born. When David was introduced to the trumpet, in his fourth-grade music class, he was immediately drawn to the instrument. But it wasn't until he heard the music of Roy Hargrove, Miles Davis, and Wynton Marsalis that he decided to dedicate his life to exploring the mysteries and intricacies of jazz. Proving to be the ultimate test of his discipline – he spent countless hours practicing – jazz became David's second language. His hard work led to many appearances at music festivals and ultimately his acceptance to New England Conservatory. 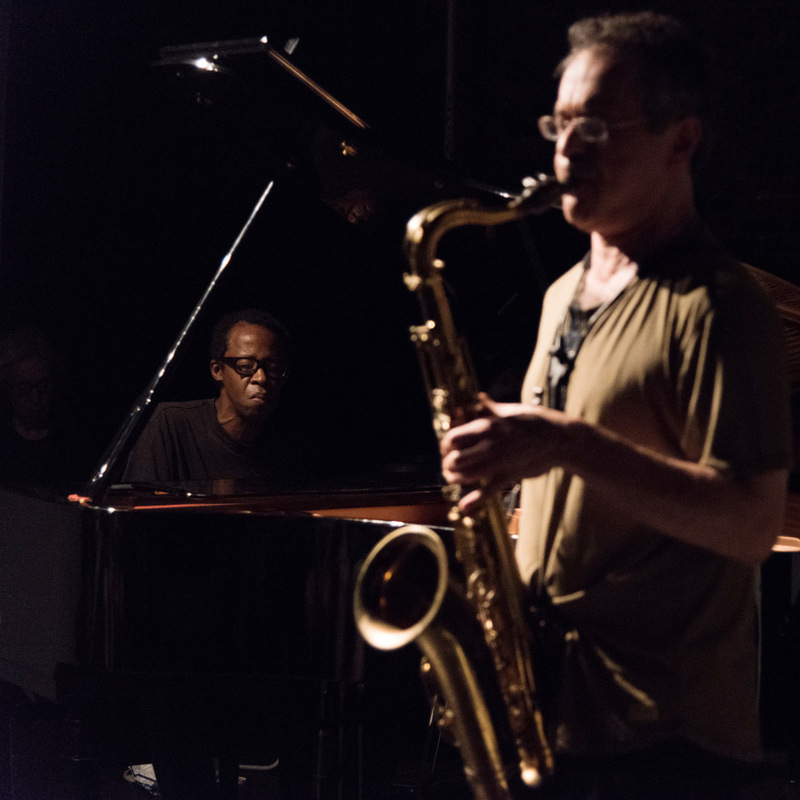 While working on his undergraduate degree there, David began crafting his artistic vision with guidance from the school's jazz faculty, including Laurie Frink, Ralph Alessi, Jason Moran, Frank Carlberg, John McNeil, and Ran Blake. 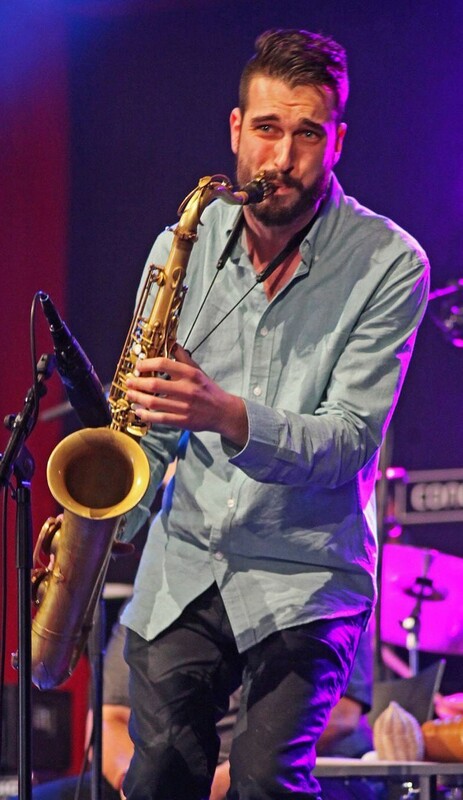 In 2015 David was one of twenty-four musicians accepted to Betty Carter's Jazz Ahead program at the Kennedy Center in Washington, DC, as well as the Banff International Workshop in Jazz & Creative Music in Alberta, Canada. 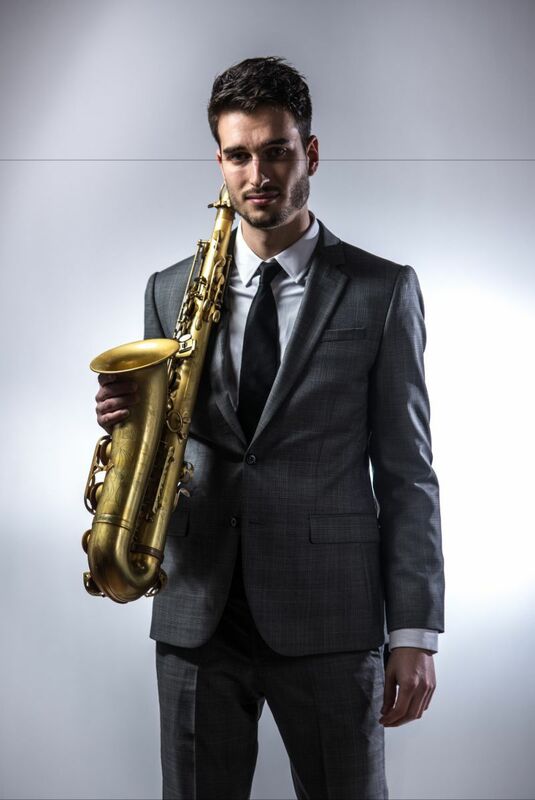 In 2016 David was one of five musicians accepted to the Juilliard School's Jazz Department and is continuing to develop his voice in New York City's renowned jazz scene. He attributes his success to a loving family that taught him the value of education, dedication to his craft, and faith in Christ. 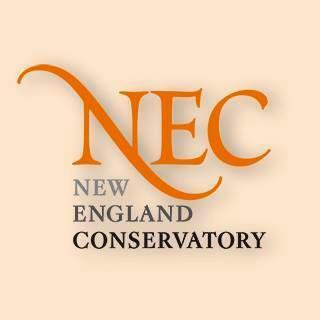 NEC's Jazz Studies Department was the first fully accredited jazz studies program at a music conservatory. The brainchild of Gunther Schuller, who moved quickly to incorporate jazz into the curriculum when he became president of the Conservatory in 1967, the Jazz Studies faculty has included six MacArthur "genius" grant recipients (three currently teaching) and four NEA Jazz Masters. The program has spawned numerous Grammy winning composers and performers and has an alumni list that reads like a who's who of jazz. As Mike West writes in JazzTimes: “NEC's jazz studies department is among the most acclaimed and successful in the world; so says the roster of visionary artists that have comprised both its faculty and alumni.” The program currently has 105 students; 55 undergraduate and 50 graduate students from 16 countries. Paul and Daisy Soros, Hungarian immigrants and American philanthropists, established their Fellowship program for New Americans—immigrants and children of immigrants—in December of 1997 with a charitable trust of fifty million dollars, which was later increased to $75 million. They created the program as a way to give back to the country that had afforded their family such great opportunities. Mr. and Mrs. Soros decided on a fellowship program because it allowed them to assist young New Americans at critical points in their educations, which they felt was an unmet need. They also wished to call attention to the extensive and diverse contributions of New Americans to the quality of life in the United States. The rigorous selection process is focused on identifying the most promising New Americans who are poised to make significant contributions to the nation through their work. In addition, the selection team looks for a commitment to the United States’ fundamental principles and ideals. Mr. Soros passed away in 2013. 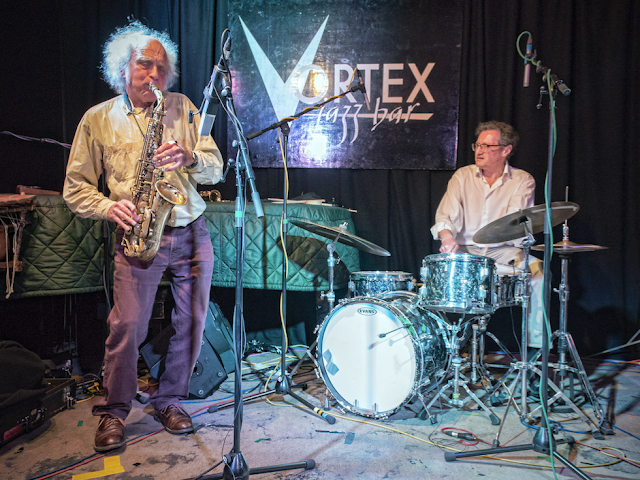 The Intakt festival has had a terrific start with sold-out concerts at the great Vortex Jazz Club! The festival lasts another 8 days, so come over and enjoy great music! A very warm thank you to all the musicians and visitors for the superb turn-out, fantastic atmosphere and your enthusiasm! Please find below some photos from the festival so far. 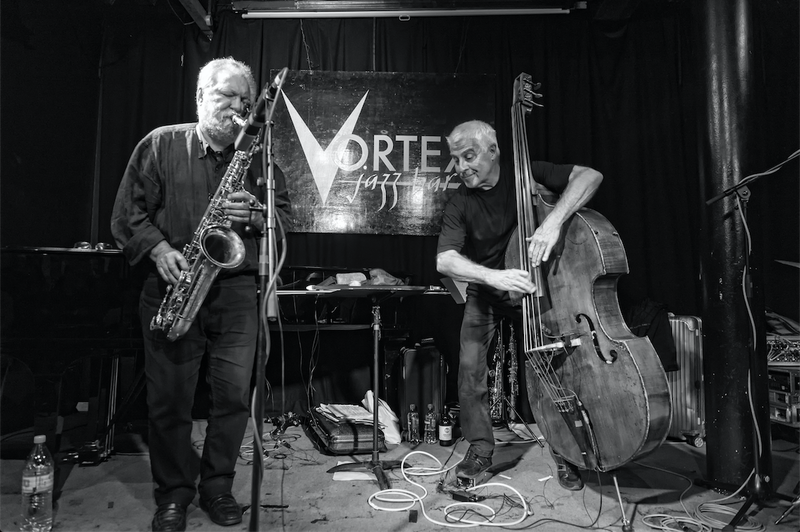 INTAKT RECORDS IN LONDON takes place from 16 to 27 April 2017 at venerable jazz venue The Vortex. The festival presents 26 performances from iconic artists and young, emerging musicians. 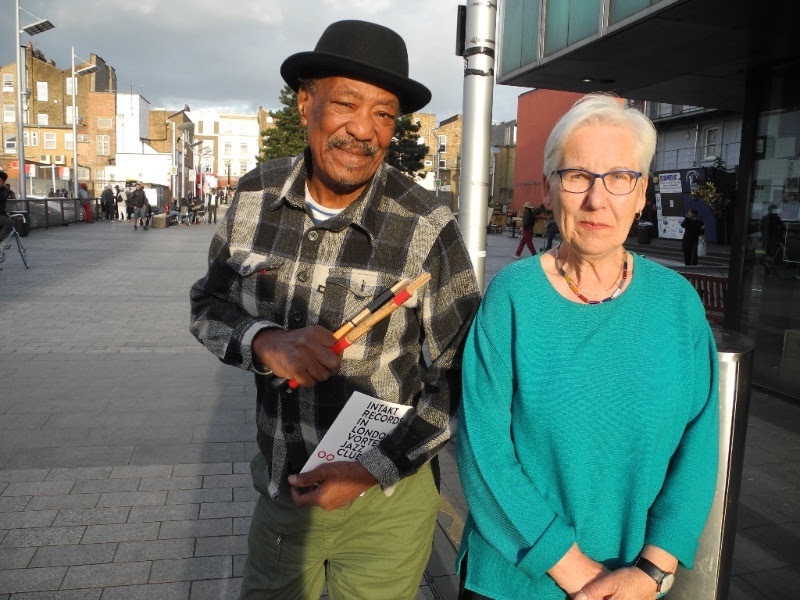 It will be launched with a celebration of the 70th birthday of bassist and improv pioneer Barry Guy. “Small in budget, but immense in quality,” says music magazine All About Jazz New York about the record label Intakt. “The pre-dominance and growth of independent labels continues.” Intakt has made a special effort to document the development of many distinguished artists and more than 275 recordings have been released to date. The label’s extraordinary critical acclaim is matched by the enthusiasm of the subscribers to the Intakt Records series. 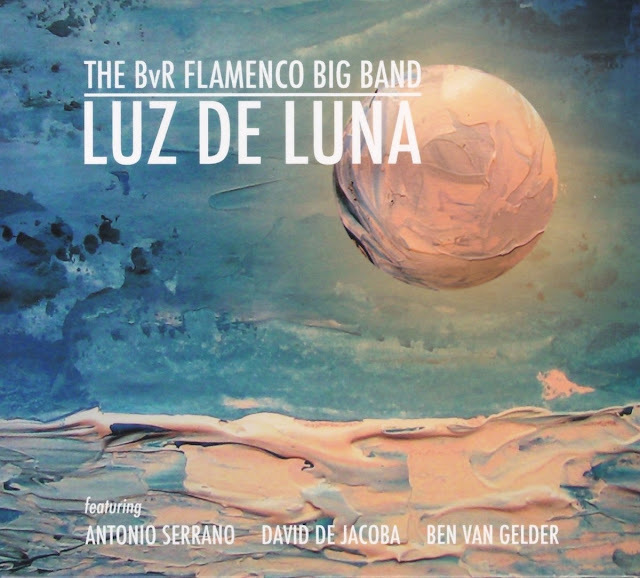 “Luz de Luna” is the sequel to ‘Jaleo Holandés, the BvR Flamenco Big Band’s debut album from 2014. Just like the first album, “Luz de Luna” features a staggering diversity of compositional approaches as well as an equally solid and instantly recognizable sound . Van Rossum has by no means kept still over the past two years, returning with this new statement bringing his musical ideas into the limelight with confidence and assertion. 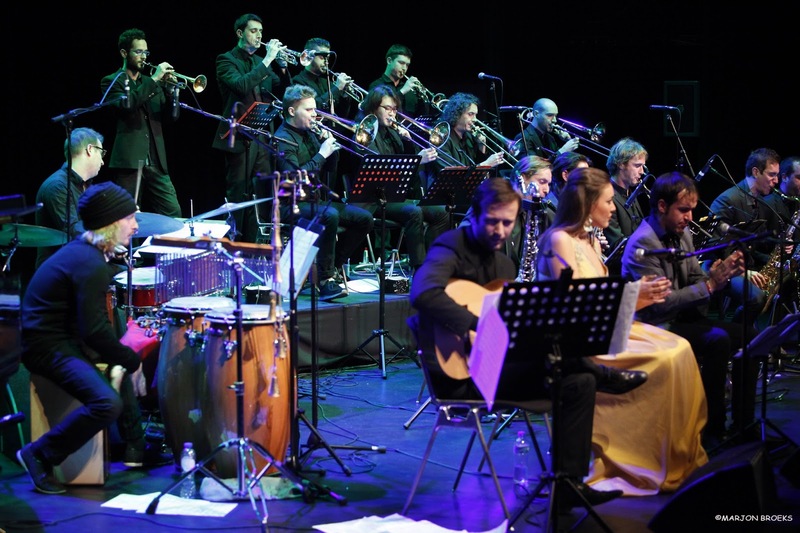 The CD fuses traditional flamenco elements like the idiomatic Flamenco voice, rhythmic guitar and the ever-present inflammatory clapping to the sound of a flexible big band. 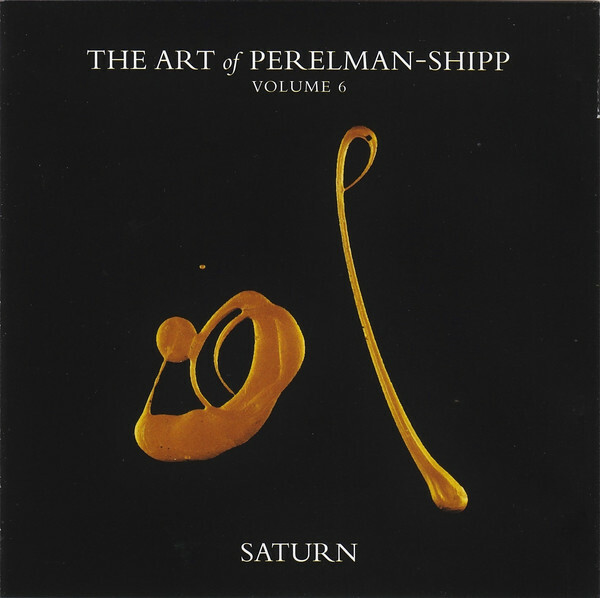 The compositions are refined and at the same time easy on the ear. An additional dimension is brought by the soloists: they maintain a strong individual voice while moving seemingly effortlessly within Van Rossum’s musical idiom. Particularly attractive are the solos of tenor saxophonist Joao Driessen ‘El Gladiador cobarde’, trumpeter Gidon Nunes Vaz and pianist Xavi Torres on “Lejos de Casa”. Singer María Marín and special guest vocalist David de Jacoba deliver compelling and energetic interpretations of evocative Spanish lyrics: “Sol que almas despertará, susurra sin gritar, mientras acaricia el mar” (“Sun that awakens souls, whispering without shouting, while caressing the sea”). A striking addition to the instrumentation is the virtuosic and soulful sound of harmonica player Antonio Serrano. At the end of the review of their first album ‘Jaleo Holandés “, it was hoped that Van Rossum’s music would soon again materialize into a record . The result: This second album is at times romantic (on the title track “Luz de Luna”), exciting (at the beginning of “Y tu ni siquiera lo sabes”) and thanks to the skillful changes of pace and atmosphere, it flows organically. 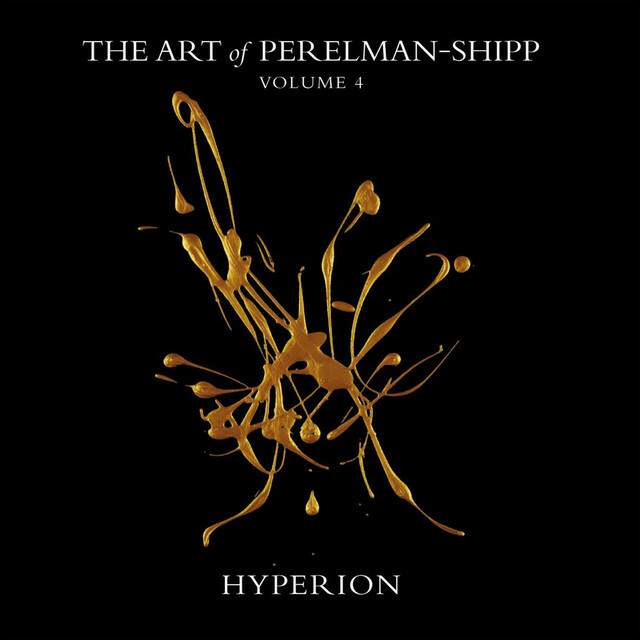 Excellent that the Fonds Podium Kunsten and the Keep an Eye Foundation contributed to making this new album possible. With ‘Jaleo Holandés, Van Rossum proved his project was an interesting newcomer to the Dutch jazz scene, with “Luz de Luna” he confirms loud and clear that the BvR Flamenco Big Band is here to stay. Bass Duo presents the historic and only performance meeting of these two renowned and innovative bass masters, each representing distinct musical traditions; both fully committed to the summit at hand. 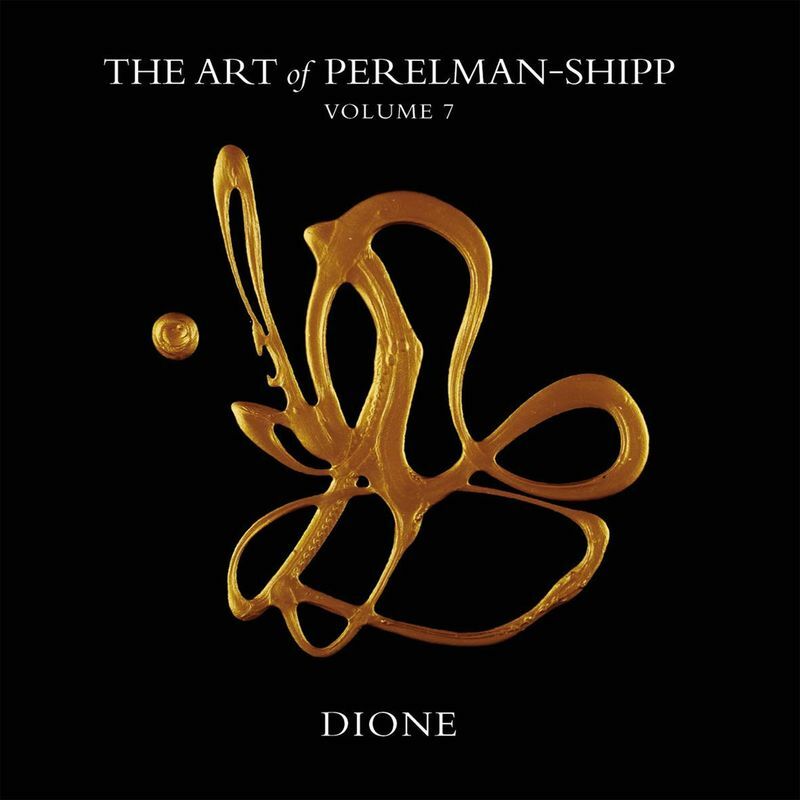 It was recorded during the Udin&Jazz 2008 Festival in Udine, Italy at Teatro San Giorgio. 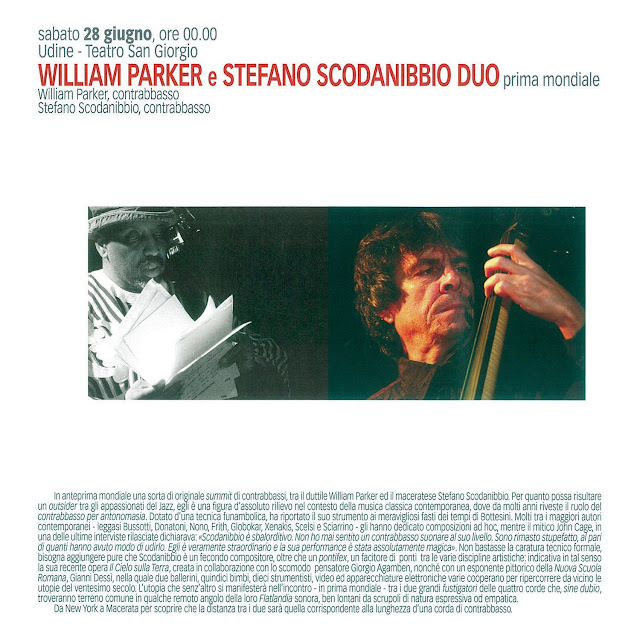 Both William Parker and Stefano Scodanibbio are bassists, composers and improvisers possessing a deep sense of musical poetry, organic inventiveness, and personal style. William Parker (Bronx, NY, January 10, 1952) was heralded some time ago by the Village Voice as “the most consistently brilliant free jazz bassist of all time” and Time Out New York named him one of the “50 Greatest New York Musicians of All Time.” He has been a key figure in the New York and European creative music scenes since the 1970s, and has performed extensively with Cecil Taylor, Don Cherry, Peter Brötzmann, Milford Graves, Peter Kowald, and David S. Ware, among many, many others. He has appeared on well over 150 albums to date, and has been perpetually presenting his own far-ranging and highly acclaimed work as a leader since the mid-90s. 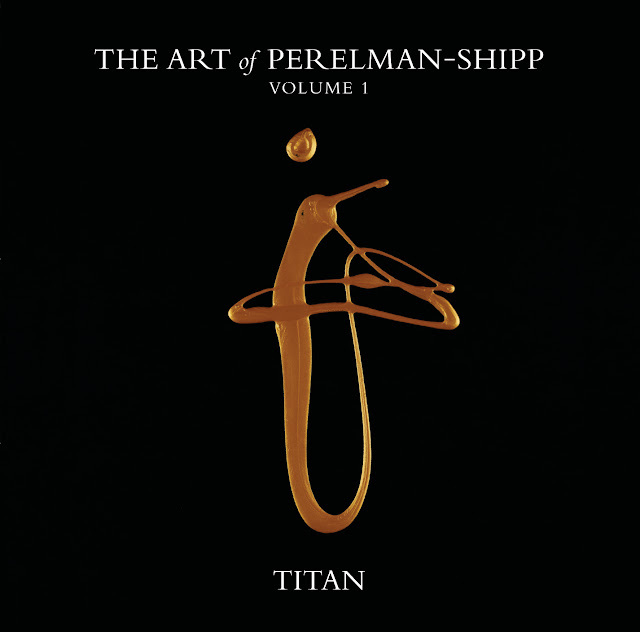 This concert recording was produced for release by William Parker on his own Centering Records imprint, and is pressed in a limited edition of 1,000 copies. 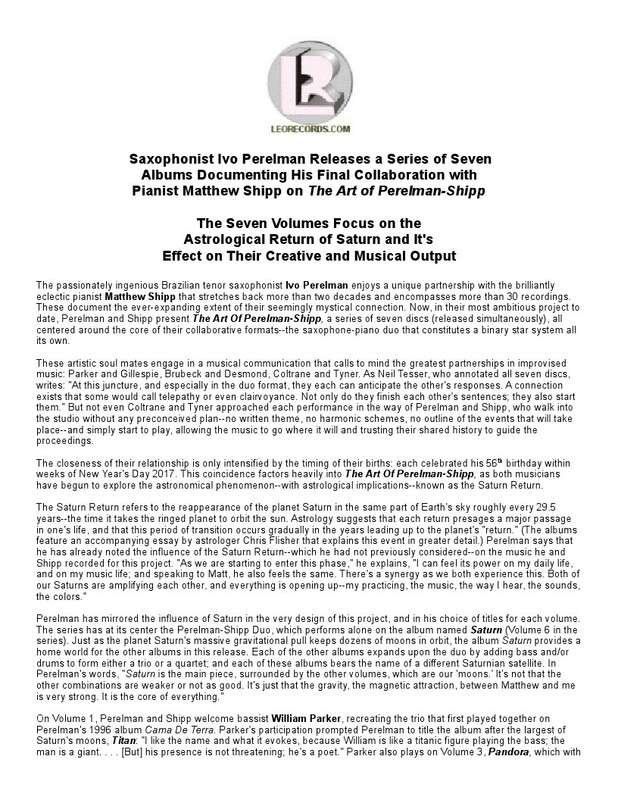 Packaged in a deluxe 6-panel digipak and featuring liner notes by fellow bassist-composer Mark Dresser, and Parker himself. 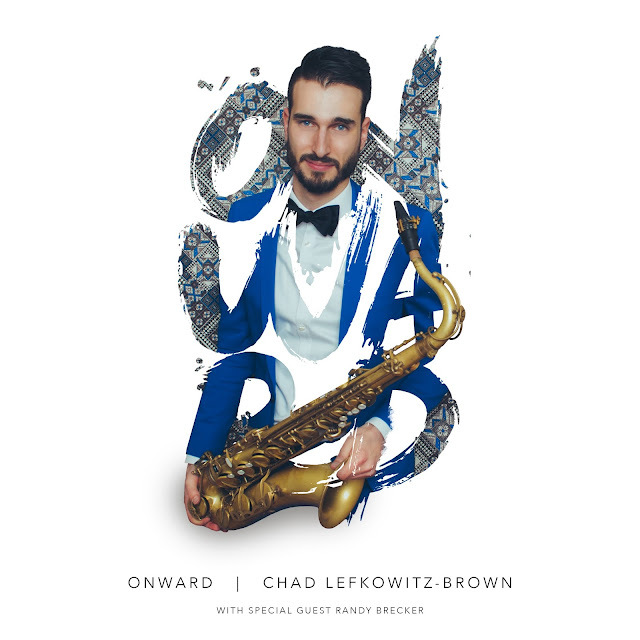 At just 27 years old, Chad Lefkowitz-Brown can already look back on a career of impressive accomplishments: he’s become widely recognized among his peers as one of the most virtuosic saxophonists of his generation, toured the world with pop superstar Taylor Swift, played with jazz greats from Dave Brubeck to Clarence Penn, is a member of Arturo O’Farrill’s multi-Grammy winning Afro-Latin Jazz Orchestra, received numerous DownBeat Student Music Awards, and become the youngest faculty member at San Francisco Conservatory of Music, where he’ll help mold a new generation of jazz musicians alongside innovators like Robin Eubanks, Matt Wilson, David Sanchez and Julian Lage. But despite having accrued enough laurels for an artist several decades his elder to rest on, Lefkowitz-Brown has firmly set his sights in one direction: Onward. 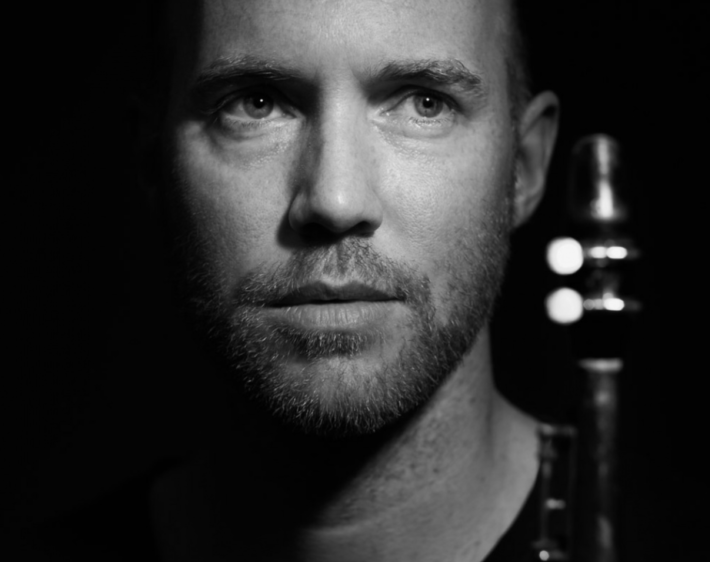 With his new album of that title, out May 12, the saxophonist takes another leap forward with a set of original compositions and jazz standards that spotlight his ferocious chops and boundless musicality. 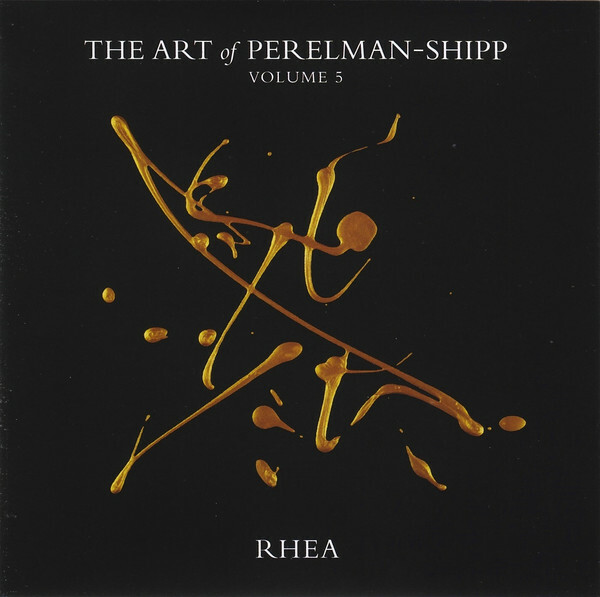 He leads a quartet of longtime collaborators and friends – pianist Steven Feifke, bassist Raviv Markovitz, and drummer Jimmy Macbride, all of whom have been exploring music together at least since their high school days – and is joined on two tracks by legendary trumpeter Randy Brecker, who lends his imprimatur to a rising star whose expressive voice bears comparison with Randy’s late brother, the iconic saxophonist Michael Brecker. In addition to looking onward in terms of the music that he plays, Lefkowitz-Brown has shown a savvy ability to cultivate a younger fanbase through his outreach on social media. With more than 40,000 followers across platforms like Instagram, Facebook and YouTube, Lefkowitz-Brown has found a way to connect with the elusive millennial audience. In that aspect of his career he’s learned a few tricks from his sometime boss Taylor Swift – albeit on a much smaller scale. Though still poised at the nascent stages of a promising career, Onward reveals the fruits of what has already been a wealth of rich and diverse experience. Lefkowitz-Brown earned his earliest performing credits on stages in his native Elmira, New York, where he played alongside then-septuagenarian drummer George Reed, a jazz veteran who’d accompanied legends like Marian McPartland and Teddy Wilson. Lefkowitz-Brown continued his education at the Brubeck Institute, where he was able to play regularly with the program’s namesake, jazz giant Dave Brubeck. 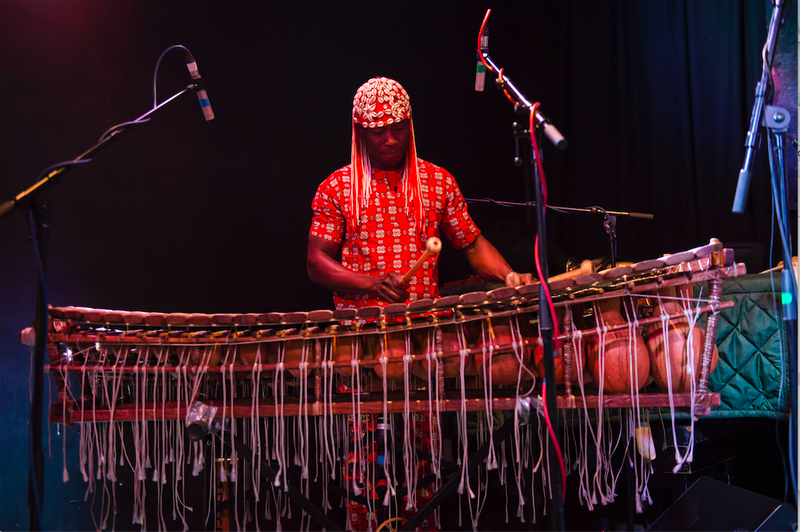 He’s since performed on the stages of renowned jazz venues and on more high-profile gigs including concerts at Carnegie Hall, Madison Square Garden, and the Super Bowl, often alongside Swift. “Experiencing first-hand the process of performing pop music to stadiums full of adoring fans made me value the importance of connecting with people through performance, even when playing more creative music,” he says. 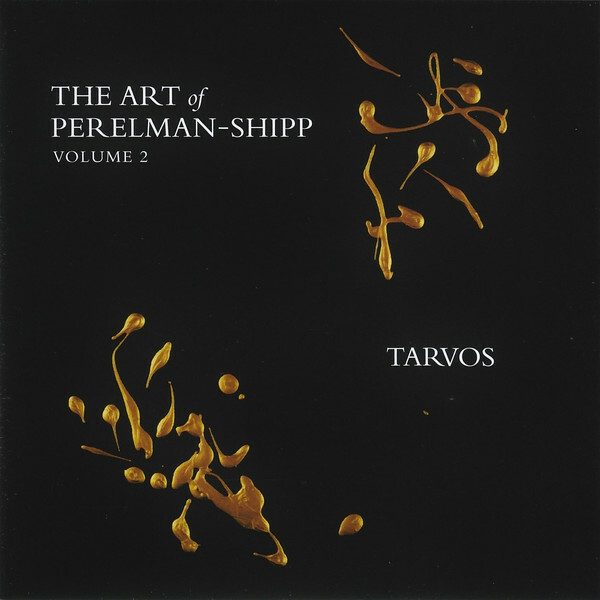 The album kicks off with the leader’s forceful title track, a blistering introduction to Lefkowitz-Brown’s muscular approach to the horn. The mid-tempo “Franklin Street” is a nostalgic look back at his childhood home, while “Deviation” is a tribute to Brubeck and his singular path through the music. 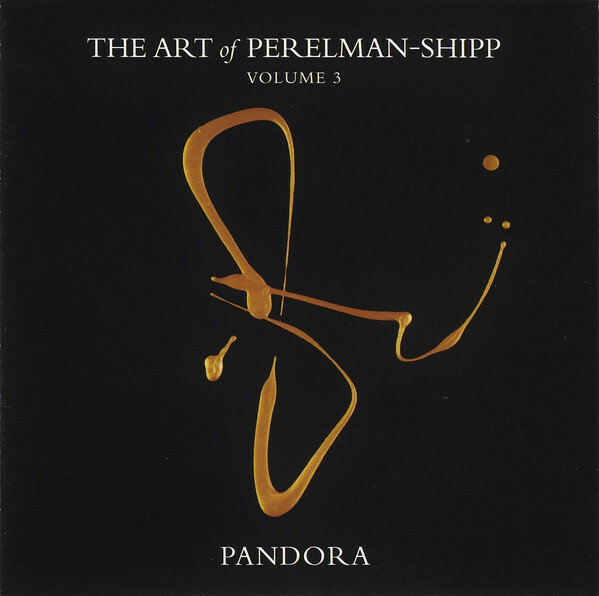 The simmering “Impetuous” hoists the description as a positive mantle, while “Blues for Randy” turns up the funk for a romp with Brecker. 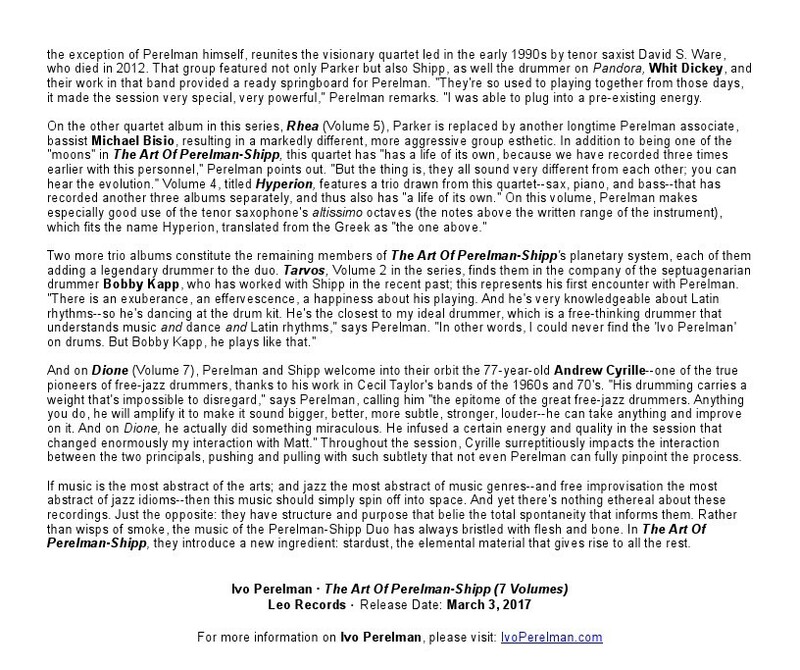 Stevie Wonder’s familiar “Isn’t She Lovely” shows off Lefkowitz-Brown’s gift for melodic elaboration, while he faces down Coltrane’s “Giant Steps,” a trial by fire for every tenorman, with fearless bravado, propelled by Macbride’s driving rhythms. He turns to breathy tenderness for “The Nearness of You,” and closes the album with a brisk jaunt through Cole Porter’s “All of You,” transforming the standard into a blisteringly swinging workout.